Some networks may restrict web usage and prevent you from reaching NC State services like GMail, or the campus VPN. The Mathematics Department supplies an internet proxy service to assist in such situations. Specifically, the proxy type should be set to "SOCKS5" and the Host should be set to 152.1.204.2 or proxy.math.ncsu.edu. The port should be set to 1080. Also ensure Remote DNS is checked. The username and password will be delivered to you once you request access to the service. 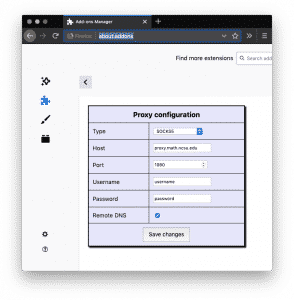 Once that is complete, FireFox's web browsing should be routing through the proxy server and allow you to connect to the desired services.